3 different models to meet all your requirements. The Gard range is always the ideal solution. They offer a width of 2.5 to 4 meters, various types of arms and a wide range of accessories with numerous accessories. Preparing to install the warning lamp. Came Kiaro warning lights are installed directly on the Gard barriers. Also stainless steel INOX for special applications. The G4001 has an AISI 304 steel housing for mounting in particularly difficult conditions, such as highway toll gates or in high-salt seafront seaside areas. Arm with rubber anti-collision profile. 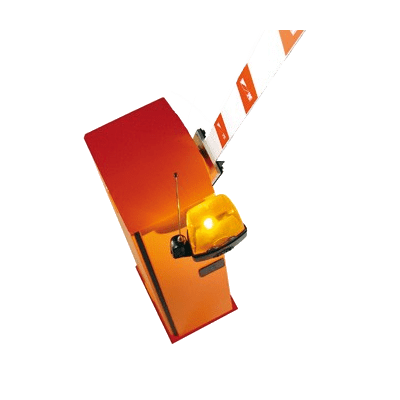 Made of rectangular or round aluminum sections, which makes them ideal for areas subject to strong winds. The G4000N – G4001 bar control panel is equipped with a special contact for their combined operation, thus controlling the movement of two coupled barriers. TOTMAN control in accordance with applicable safety regulations. Obstacle detection function. A special electronic circuit continually controls the operation of the automation and causes it to stop or reverse the direction of movement in the event of any obstacle. Automatic road barrier for widths up to 6,5 m.